Wait. You say, the LG 34UM95 is actually not the world’s first 34-inch display? This is true. But it definitely is the world’s first 34-inch display for real creative professionals. Let me explain. It’s not only the size that matters here, it’s the resolution that’s the real game changer. 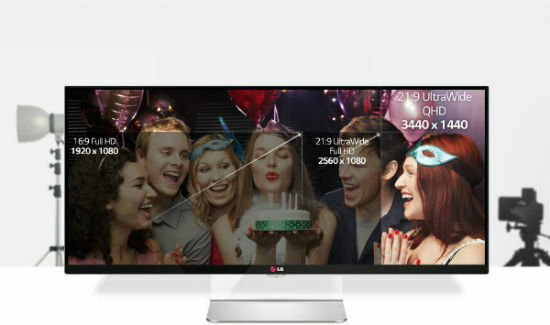 The LG 34UM95 sports a mighty QHD resolution of 3,440 by 1,440 pixels. With a resolution like that, creative professionals might feel tempted to waive their two monitor configurations and go back to working without neck pain. Especially creative workers using Photoshop, Illustrator, InDesign or those whose daily bread is the editing of audio and video, are certain to profit from the much larger width. Actually, I don’t know one single creative professional who is not working with a two display configuration. I personally am sitting in front of a 27-inch device, with a 24-inch display to the right side of it. The main display is connected via Displayport, the secondary via HDMI. My 27-inch monitor shows a resolution of 1,440 pixels height, but only a width of 2,560 pixels. Staring at the screen I can well imagine, that the additional 880 pixels, the LG 34UM95 offers, would become me. I guess the jury members, responsible for choosing the Winners of the Technical Image Press Association Awards 2014 (TIPA 2014) felt the same. The LG 34UM95 got declared winner of the category "Best Photo Monitor". And this is a perfect description of what this ultra-wide big beast is best at. If you are into editing photos professionally, you know that working with two monitors simultaneously is not without problems. Most importantly, colors differ. You can’t reliably and consistently edit an image across the borders of two displays, not even if they are identical displays by the same manufacturer. More often than not, resolutions differ, too. I don’t like to have to actively look away from one display and refocus on the second. I’m annoyed by the bezels, the different heights. Let me put it straight: my desktop solution is far from ideal. Talking about color consistency, the new LG supports sRGB to an extent of 99%, almost fully. 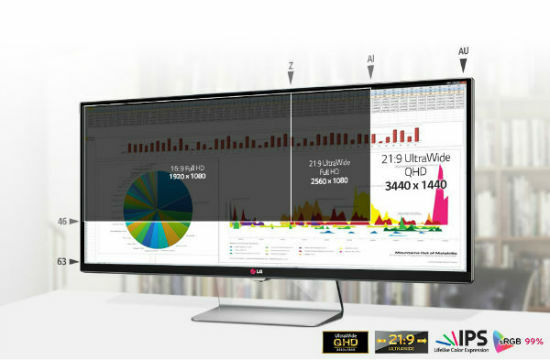 An additional software, LG’s True Color Finder helps you calibrate your display perfectly. 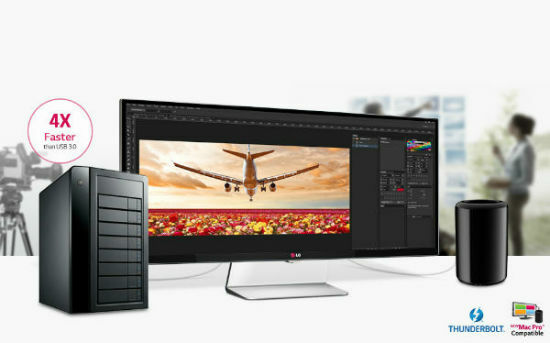 If you aim for maximum fun and power, connect the new LG 34UM95 via Thunderbolt 2 to one of the new Mac Pros. 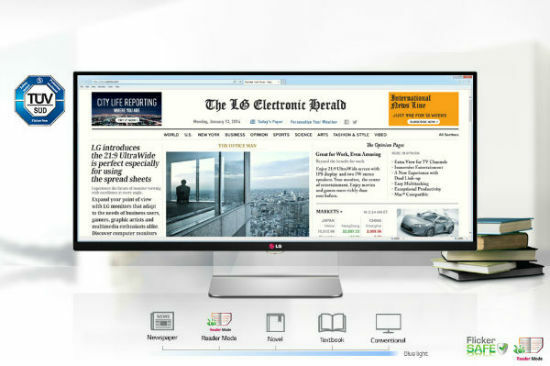 LG designed the display with a focus on the newest Apple high-end device. If you attach a data storage to the monitor, it is able to read its contents directly, without a computer’s help. Using Thunderbolt 2 you can even attach two 34UM95s to your Mac Pro and run both of them in the full resolution, thus making for a massive workspace of 6,880 by 1,440 pixels. The certified Flicker-Safe feature makes sure you never ever notice any kind of flicker to strain your eyes, no matter to which values you adjust brightness or contrast. Are you a proud owner of a MacBook Retina Pro Late 2013 or newer? The LG 34UM95 is perfect for you, too. There are reports by happy users who tried it and confirm to be able to display the full resolution of 3,440 x 1,440 pixels. This is great news, as LG itself limits the compatibility to Mac OS devices to the new Mac Pro explicitly. Users on Windows devices find a wider variety of supported chipsets, but should update their drivers beforehand. Although some complain, it wouldn’t be the case, the 34UM95 follows the VESA standard, and can be wall-mounted. What’s your take on the matter? How do you like a size and resolution like this? Will the LG 34UM95 be your next impulse purchase? 3,440 by 1,440 pixels ! I need to get one asap. I used to do that until I got my 27″ iMac. It has enough space for me (and I even use Corel Painter). However, this display does seem awesome. Can you touch on input lag? No reviews yet touching on this. Wonder if this would make any differnece?